Donald Trump’s travel ban on seven predominantly Muslim countries is still unenforceable, at least for now. 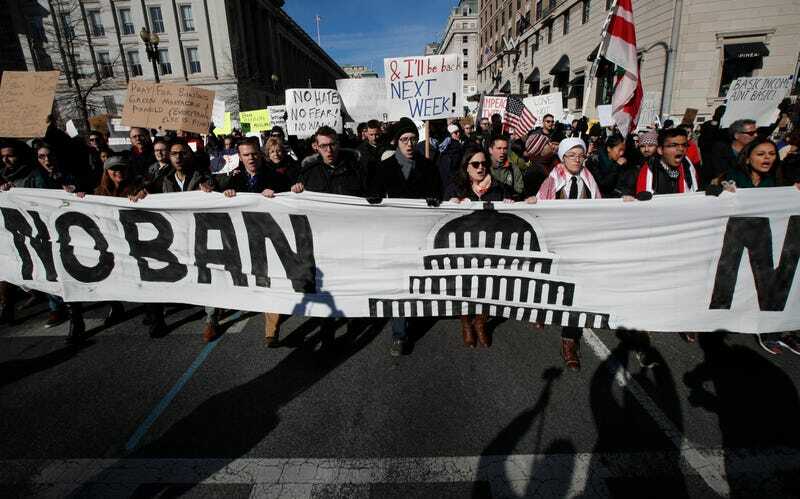 On Sunday, a federal appeals court judge for the Ninth Circuit rejected a request submitted by the Justice Department on Saturday to immediately restore Trump’s ban. On Friday, federal judge James Robart (or as our retweet-addicted president calls him, “this so-called judge”) issued a temporary hold on the travel ban, revalidating some 60,000 visas revoked under the executive action Trump signed on January 27. If it seems like a new legal challenge is issued in relation to the ban just about every day lately, you’re not wrong, and that’s not about to change. According to Buzzfeed News, the ban will only certainly be blocked through the weekend, as a decision on an additional request to restore the ban is expected to be made Monday afternoon. A Justice Department spokesperson told the Washington Post that they will wait until that judgment is delivered before making their next move. Justice Department lawyers defended their request, filed Saturday night, for the ban to be lifted with fear-mongering and by reminding the court that the executive action is based on the president’s, “national security judgment,” which, to be quite honest, probably didn’t help their case much.